And now for something completely different. Have you ever sat up late at night; perhaps after an cocktail or two, and had a crazy idea? Something like: "Hey! We should build a ten foot tall giant steel banjo! ", and instead of telling you that you're crazy your friend says "Yeah! And it should be PLAYABLE!". Welcome to the genius of the magnificently twisted and wildly creative minds behind Heavy Metal Stringworks. David Sakalauskas and Steven Cannaert have been friends for years and--along with a slightly warped sense of humor--share a passion for live music and tinkering with things. For years they had been tossing around the idea of building a giant banjo sculpture to donate to the Wheatland Music Organization. 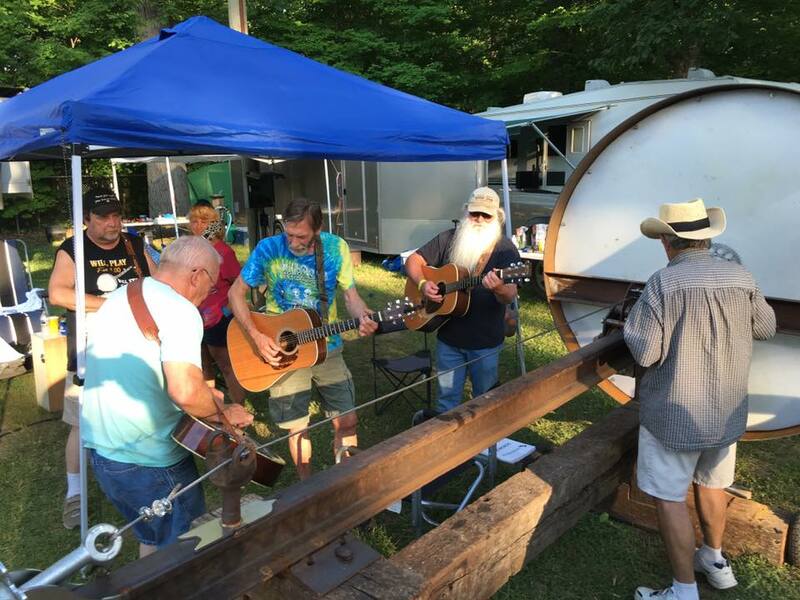 The passing of long-time organizer Mike Bunting (who--according to legend attended his first Wheatland to return a banjo he had borrowed) provided the motivation to bring their dream to life and the "Big Banjo" made it's debut at Wheatland last fall. From that humbly grandiose beginning came the idea for Roots Rusted Revival--an ambitious, interactive sculpture installation that simultaneously celebrates Michigan's rustbelt industrial heart and roots music soul. And what better way to show off a bunch of gigantic, rusty, playable, musical sculptures than to get Founder's to agree to host the installation as part of ArtPrize in September! Dave and Steven's vision has grown to include a trio of oversized, yet playable instruments; built primarily from found and reclaimed materials; developed organically with changes and modifications suggested by people who interact with the sculptures at various musical festivals; all coming together to create something greater than the sum of the rusty bits and pieces that make up the sculptures. All summer long these maestros of musical magnificence have been traipsing all over the state, working on their vision. Their interactive sculptures have made appearances at the Charlotte Bluegrass Festival, the Ryan Bellows Bluegrass Bizaar, the Midwest Test, Feral Fest and several smaller events. Look for them at the Hoxeyville Music Festival in August as well. 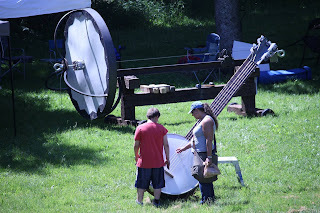 The Big Banjo was the first creation from Heavy Metal Stringworks. 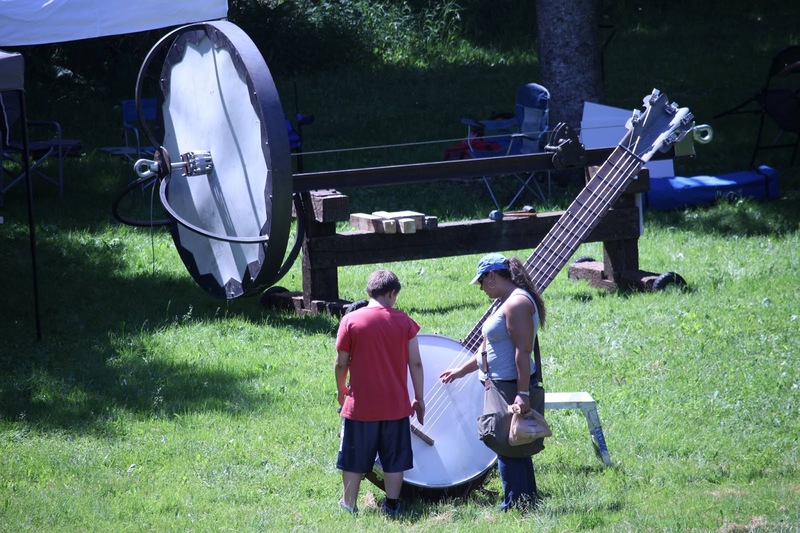 Standing over 10 feet tall and weighing in at over 600 pounds, this mammoth banjo--by some measures--qualifies as the world's largest playable banjo. They're waiting to hear back from the folks at Guinness to verify this. Authentic in every aspect, the Big Banjo features a steel pot, adjustable polyethylene head and a fully fretted custom steel neck made from a surplus highway guardrail. Ratchet strap hardware allows for coarse tuning of the stainless steel strings, with an ingenious fine-tuner setup hidden behind the head to perfect the pitch of each string. While difficult--but not impossible--for a single person to play (either Scruggs or Clawhammer styles work), the Big Banjo really sounds incredible when played by two (or more) people. Some on the frets, some plucking strings, some beating on the head like a drum, even playing the short strings between the tailpiece and bridge for some harmonics--the possibilities are endless. Recently, they guys have even added a piezo-electric pickup allowing the Big Banjo to be played through an amplifier with a variety of digital effects for some truly unique sounds! How to top the Big Banjo? Introducing the BasTrak! 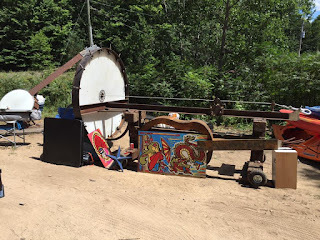 At it's core, this post-industrial nightmare of an instrument is essentially an enormous washtub bass lying on it's side. With an eight foot diameter head resting on a frame of railroad ties, and a twelve foot neck made of a old train rail, this behemoth weighs in at over 3/4 of a ton! Less instantly recognizable as a musical instrument, the BasTrak is normally played by striking the steel cable with a rubber mallet while sliding a heavy steel trolley along the rail to control pitch. Like the Big Banjo, the BasTrak has undergone continuous, incremental improvement based on feedback from people who've played it. A new floating head (courtesy of some discarded stock car valve springs) and an ingenious pickup system allow for a tremendous range of tones. At one point this summer, over a dozen people were simultaneously playing the string, the head, the rail and even the frame to create a post-modern dance groove late into the evening. The most ambitious piece to date is the Steel Dobro. Modeled loosely on a pre-war National Squareneck dobro, this self-standing, 6-sting masterpiece is remarkably light (well under 400 pounds) and easily playable by a single person. With a steel body wearing a heavy coat of rust and patina, the stainless steel top really stands out and creates not only a striking visual contrast, but a sharp, clean tone to offset the deep bass of the hollow body. The strings are held way above the fretboard for easy slide playing in the traditional style. A hand crafted tailpiece (with integral fine tuners) is a masterpiece of design and on-the-fly engineering as are the spring-steel "fingers" that support the tuning "machines" at the headstock. The strings run over a hand-hewn oak saddle and nut and transfer (for now) the sound to the sieve-plate resonator (salvaged from an old clothes dryer). The piece simply has to be seen, touched and played to be appreciated. In the middle of a warm, Michigan summer, pick a calm, quiet evening and step outside. There you will hear the faint musical echo of our state's past: the rhythmic striking of axes against tall Northern Michigan pine trees; the slow rumble of dynamite blasting an iron ore face in a U.P. mine; the sharp crash and clang of hydraulic presses in Detroit and Flint's great automotive plants. If you listen closely, you will also hear the ghosts of our blue collar ancestors singing and making music with family and friends; with simple, traditional instruments--the guitar, and banjo and washtub bass--they brought with them as they moved from the poverty of the south to the opportunity of the Midwest. Though the trees are gone, the mine's have shut down, and the great factories lie rusting and crumbling, the spirit of those songs still lives in each of us. In a real sense, it lives in the popular music of our generation--in Barry Gordie's Motown, in Bob Seeger's Classic Rock, in Kid Rock's rap/rock fusion and in Jack White's modern pop. In another sense, it lives in all of us--in our work ethic; and our spirit; and our passion; in or creativity and our ingenuity; and in the dirt, grit and blood we pore into our daily lives. Roots Rust Revival is about more than creating sculpture; it is more ambitious than building the worlds largest playable instruments; and it's definitely about more than continuously and incrementally improving the work through the interactions in all of us. These pieces are about embracing the music in each of us; about the beauty of seeing what is old reborn into what is fantastic; about seeing with the eyes, embracing with the hands and appreciating with the heart; about the transfer of experience--be it the small brown stain of rust on your hands the work gives to you, or that little piece of your soul that lingers on the steel where you touched it; about giving life to the inanimate through experiencing it with all of your senses; and about the very act of creation--just because you can. Roots Rust Revival is important not because it is like nothing you've ever seen or heard, but because it IS everything you've ever seen and heard. More pictures from Heavy Metal Stringworks below. The Milan Bluegrass Festival and "Jam in the RV" with The Ol' Hippie Bluegrass Show. 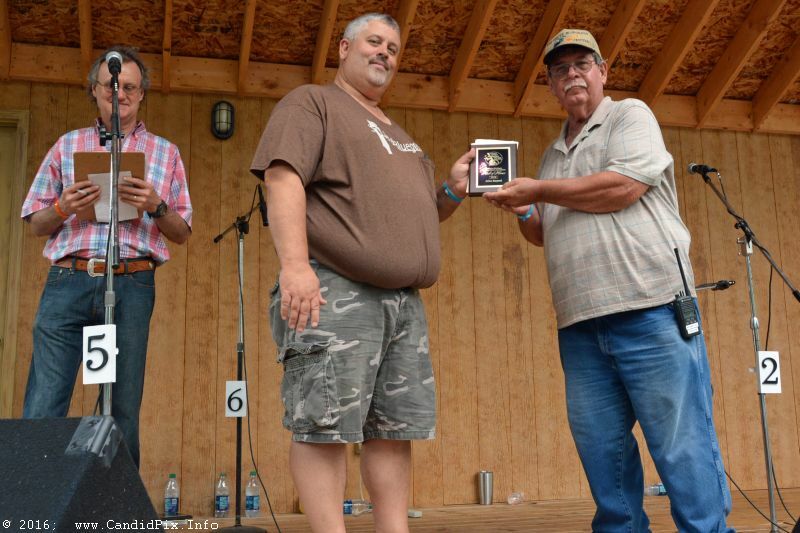 In a summer full of over-the-top Michigan bluegrass festivals, the Milan Bluegrass Festival at KC Campground was one for the record books. Despite mid-90s temperatures and humidity levels making it feel more like a mid-winter sauna than a mid-summer campground, attendance was definitely up and the crowd was treated to some incredibly innovative and spectacularly interesting events that teamed up to make this festival unique and the "must-see" event of the summer. Not only do you get to see the "A-List" of Bluegrass at Milan (Rhonda Vincent, Russell Moore and IIIrd Tyme Out, Dailey & Vincent, the Gibson Brothers and Blue Highway all played this year) but promoter Mark Gaynier continues to bring in new, fresh and exciting acts to expand the bluegrass audience. The old-time sounds of The Wayfarers (more on them below) and a thunderstorm inspired entirely acoustic set under the pavillion by Mountain Faith stood out this year. The youngsters in Breaking Grass even managed to mix in a medley of current-day pop hits without anyone noticing (well, not too much anyways). Overall, this was definitely the best listening show of the summer. However, like every bluegrass festival, it was what happens OFF stage that makes things special, and Milan was no exception. 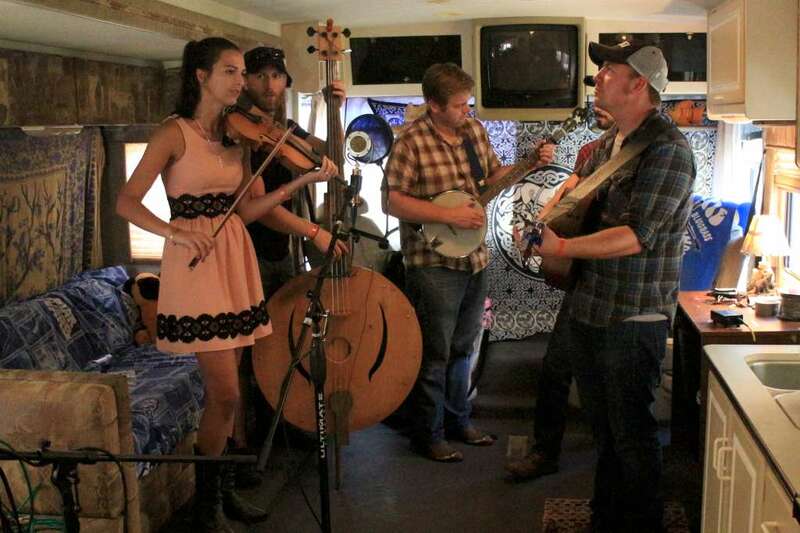 Bluegrass festivals has always been about community, and Milan is no exception. Arriving early in the week, I set up the "SeMiBluegrass Jam Tent" in our usual spot--out in the grassy field north of the pond. The crew from the Ol' Hippie Bluegrass show was setting up their TeePee next door. Brian from the UP and Tammy from Monroe set up their tents nearby. As the week went on, festival friends and neighbors continued to arrive, set up camp nearby and drop by to say "Hi!" By Thursday, an ad-hoc neighborhood had sprouted amidst the grass in our little field. Though I see most of them only once a year, we picked up where we left off, sharing gossip, cold beverages and old songs as we renewed the friendships we have forged around bluegrass for yet another year. The BBQ dinners served each night as a fundraiser for T.H.A.N.K.S. (Tailgaters Helping Aid Need Kids' Spirits) help bind the community as they break bread together over some pretty amazing chicken and pork loin. 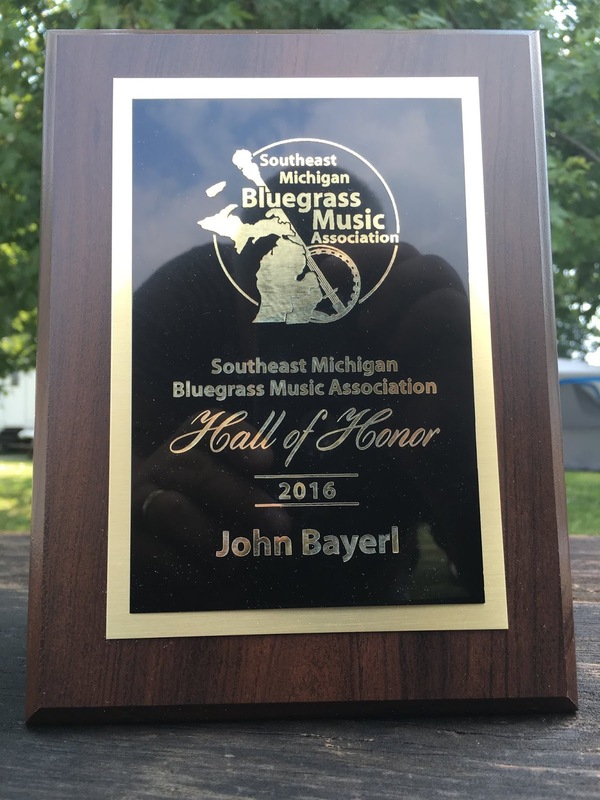 The festival serves as home-base for the Southeast Michigan Bluegrass Music Association, who--in addition to getting kids interested in bluegrass through their "Instrument Petting Zoo"--inducted a group of people into their "Hall of Honor" during the festival for their efforts to "Preserve and Promote Bluegrass Music in Southeastern Michigan". As I always say, "It's about the People, the Places and the Music...Always in that Order!" Know for camping out of a Teepee at Milan, Jerry Eicher, the long-bearded, tie-dye wearing host of the Ol' Hippie Bluegrass Show (live Saturday at 10 pm & Wednesday at 8 pm on 95.3FM (WQTE) Adrian, MI and Saturday morning at 9 am on 90.3 WCWA (Owensborough, Ky) brought their new LIVE Internet show (courtesy of worldwidebluegrass.com) to the Milan Festival. With an RV borrowed from his niece and nephew, some cool decorations and long Cat5 cable to the campground office, Jerry created the "Jam in the RV" for the show. The concept was simple...broadcast live from 9pm to 11pm each night with interviews and live performances from the bands and people associated with the festival. With a little mountain-man/hippie magic and a twinkle in his eye, Jerry managed to create a work of ephemeral perfection. 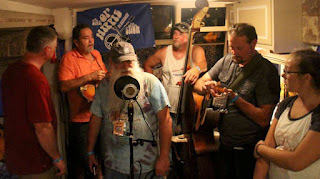 The Wayfarers "Live from the RV"
Nearly every band managed to pop into the RV and record an interview a play a live piece. 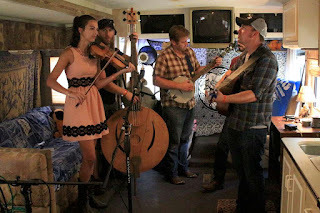 On Thursday, The Wayfarers from Ohio set the RV on fire with their incredible high-energy take on old-time bluegrass instrumentals. Gathered around Jerry's Ear Trumpet Labs Microphone, this group of young friends puts a distinctly modern spin on pre-bluegrass era mountain music with the driving clawhammer banjo of Jake Loew and classically trained fiddle chops of Kenzie Maynard perfectly complementing the complex three- and four- (and sometimes five-) part harmonies. Josh Harman (guitar) and Brandon Bankes (mandolin) provide enough drive for two bands. 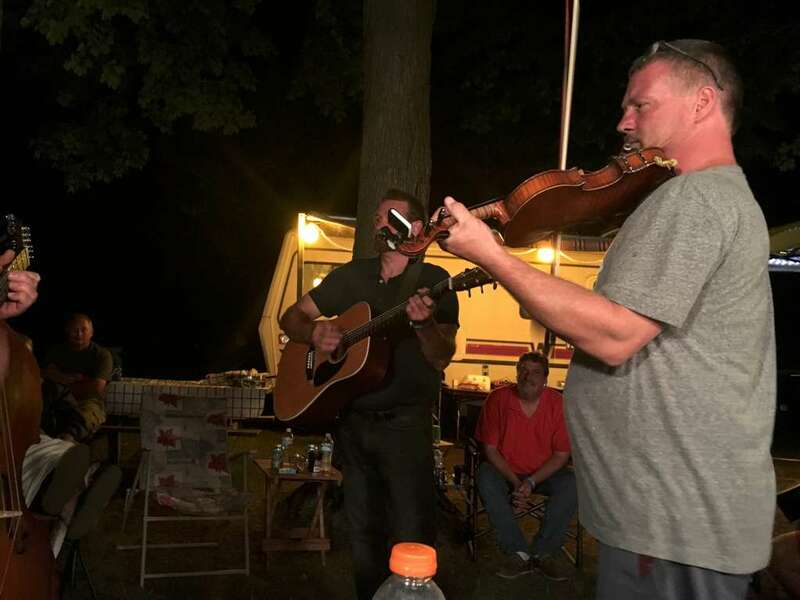 Like any good "Semibluegrass" band, they know the words to most of the fiddle tunes you hear at a jam--a rare skill set that makes those old standards new and fun again! The homemade washtub bass of Nathan Zangmeister serves as a perfect metaphor for this band. Unusual, home-made, unexpected and somehow perfect for the music. 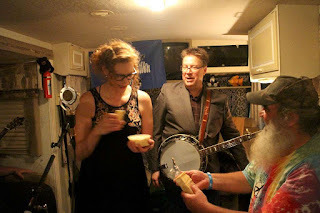 Jerry likes to have fun, and perhaps no one epitomized that ethos than when Becky Buller stopped by the RV with banjo-player and Bluegrass Junction (XM) Radio personality Ned Luberecki to play a couple of fiddle/banjo tunes and sample some of Jerry's home made pimento cheese (apparently a running gag on the Becky Buller World Tour). Becky has made a career of mixing great music and singing with an approachable and affable personality on stage. Her shows are just good, wholesome fun! In the RV, that personality exploded into a non-stop hour of good humor, good friends and good eating. Luberecki's instantly likeable personality and "made for radio" voice seamlessly melded with Buller's innocent looks and quick wit to create comic gold. Ned trying to do the play-by-play of the Pimento Cheese tasting while Becky--with mouth completely, yet daintly, full--mumbling "It' Good! It's soooo good" was comic genius! When I looked over at Jerry trying to keep it together and move forward with the interview, I couldn't help myself...I was on the floor laughing. 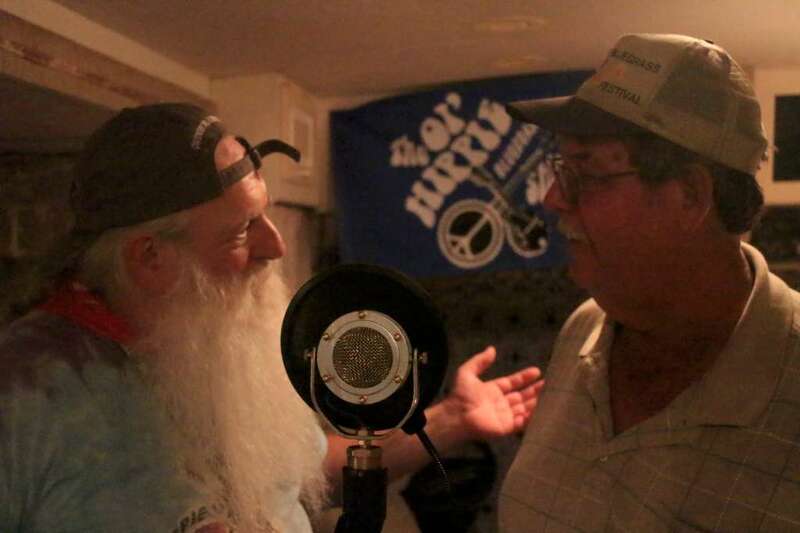 I'm sure Jerry recorded this and it's sure to be one of his most downloaded podcasts on his Ol' Hippie Bluegrass Show website. Jerry also interviewed many of the folks who make the festival special: young guitar-picker Jesse Manns threw down some hot guitar licks; I talked about the SEMBMA Hall of Honor; Bill Warren hyped the Instrument Petting Zoo; campground owner and festival promoter Mark Gaynier made it on the air to talk about next year's lineup. However, the most special moment of the entire festival came when--needing some live music to fill up the show--Jerry reached out to some of the campground jams to come into the RV and do a live number or two. 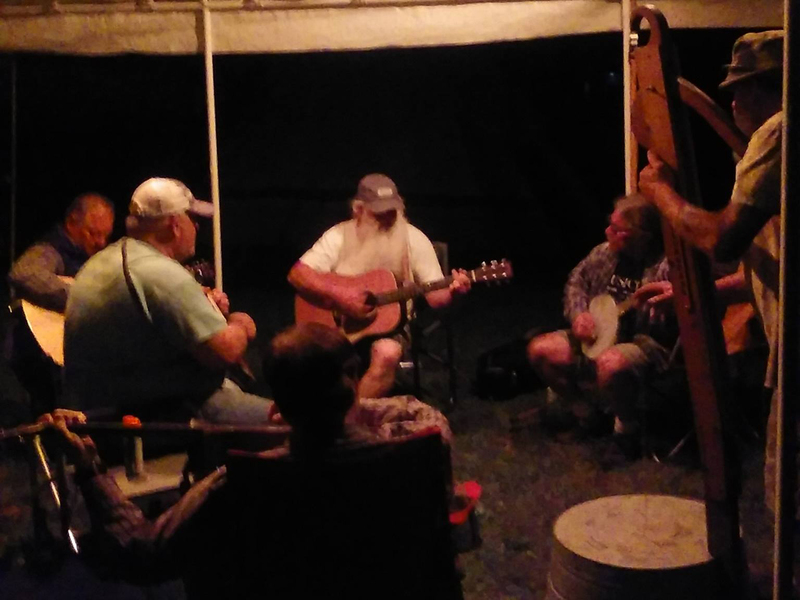 First to answer the call was the quintessential Milan Bluegrass campsite group the informal Red, White and Bluegrass Band. 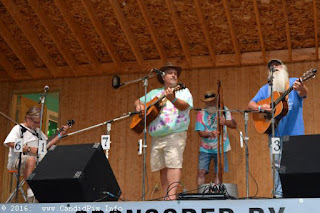 Long-time festival attendees will recognize brothers Sam Costelli (guitar) and Tam (mandolin) with their nephew Reno Costelli (bass) and Fossil Creek Bluegrass Band fiddler Darrell Wagner from their all-night, full-throttle and full volume, free-wheeling jam by the pond. I've included some photos from the Festival below. Feel free to tag, share and use freely with credit to www.semibluegrass.com. Want more great semibluegrass content? Subscribe to the blog, or better yet, follow us on Facebook! A Deep and Heartfelt "Thank You"
Over the past few years I have done my best to make people aware of the vibrant and blossoming acoustic music scene in Southeast Michigan. I gone to hundreds of shows. I've written dozens of online reviews. I've attended most of the local music festivals, open mics and musical events. I even volunteered to serve as the Vice President of the Southeast Michigan Bluegrass Music Association. I've done all of this because of my passion for live, local, acoustic music in Southeast Michigan. So it was with great shock that I learned I was to be inducted into the 2016 class of the SEMBMA "Hall of Honor" at the Milan Bluegrass Festival last week for my "efforts to promote and support bluegrass and acoustic music in the region". I am both incredibly honored and completely humbled that my modest contribution has been noticed, and has made a difference to people who share my interests and passions. To the person who nominated me, and all of you who support what I do: Thank you! This award is as much for you as it is for me. Now go find some live, local music!